Why do I need life insurance in my 50s and 60s? 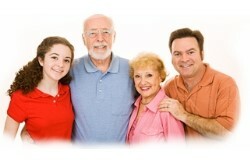 In many cases you can take out a life insurance policy up to the age of 75 and renew it until age 100. But why would you have life insurance past your 50s and 60s, particularly if you’ve paid off your mortgage and the children have left home? Today your children may have left home but things can change. If they lose their jobs, return to study or return home due to separation or divorce, you can soon be supporting them again. On top of this you could also find yourself responsible for grandchildren. This is a strong argument for maintaining your life insurance cover well past your children turning 18. Alternatively you can take out insurance cover for your children until they are able to pay for it themselves. While the mortgage on the family home might be paid off, you may have taken on debt to buy other properties or investments. Although there may be some equity in these investments their value could be severely diminished if your family had to sell these assets prematurely because the debt could no longer be serviced. Ensuring that your life insurance is sufficient to cover these debts can enable the original intention for these investments, e.g. retirement planning or inheritance for children, to still be fulfilled. A life insurance policy can be an important means of equalising the split of assets amongst family members. Where you have “lumpy” assets or you are running a farm or a small business and only one of your children would be interested in taking over on your death, you can use your life insurance policy to achieve an even split for the remaining children. For example if you have two children and one is to inherit a business or farm worth $2M the other child could be the beneficiary of a $2M life insurance policy. The alternative, where the business or asset is left to both children, would require one child to take out a loan of $1M to buy out the other child, with all the expense that this entails. Mortality rates rise rapidly after age 50. Certain cancers and illnesses are more prevalent as we get older. For example the chance of a diagnosis of prostate cancer is 1 in 1000 for a man in his 40s. However the probability of this rises to 12 in 1000 for a man in his 50s, then 45 in 1000 in his 60s and 80 in 1000 in his 70s (statistics from the Prostate Cancer Foundation of Australia). Before cancelling your life insurance policy you need to remember your reasons for taking out the cover in the first place. It may well be that you had a special need such as providing for a disabled child on your death. This need is unlikely to have changed as you grow older. Now that level premiums are available from some insurers to age 70 it is possible to make significant savings if you take out a level premium before age 50. If you are currently paying a stepped premium and switch to a level premium you will find initially that the level premium is much higher than what you are currently paying. However as the level premium does not go up over time it will ensure that the cover will continue to be affordable into the future when you may need your cover the most and when money could be short. An alternative to cancelling your life insurance policy is to gradually reduce your cover over time to manage the cost of rising stepped premiums. Each year when you receive your renewal you can send a signed request to the insurer to reduce your cover. Some insurers offer a Premium Freeze option which will automatically reduce your cover each year to keep the premium the same. However it is preferable that each year you weigh your needs against the cost so that if your circumstances change, i.e. you are diagnosed with cancer, you can maintain your cover at its current level. If your health is good you could also consider changing to an insurer offering a better deal – by using our Compare Quotes Online service. 8. How healthy are you? If you are of a mature age and contemplating cancelling your life insurance policy be sure to have a thorough medical check-up first. Stories abound of clients who are diagnosed with cancer or other serious illnesses soon after cancelling their policies. Getting a clean bill of health before cancelling will help minimise the likelihood of this happening to you. When you first took out your life insurance cover you were probably young and healthy. But if you wanted to take out life insurance cover today you may not be able to get it on the same terms. You may have changed your occupation to something more risky (e.g. offshore drilling), your health may have deteriorated (e.g. you may have diabetes or be overweight), or you may have taken up a risky pastime (e.g. ultralight flying or gliding). Any one of these factors could mean that life insurance would not be available, or if it was, the cover could have exclusions or the premium heavily loaded. If this is the case you should hang on to your existing life insurance as long as you can – not only because of the cost/conditions of a new policy, but because you have been assessed as having a higher risk profile than normal. Many life insurers are allowing partial rollovers from existing super funds to fund insurance policies held in dedicated “insurance only” super funds. The rollover pays your annual life insurance premium and the fund holds your policy in a super environment. While this can be tax effective and ease your cashflow problems there are some negatives to this approach – see Pros and Cons of insurance in super and go to Get Advice to speak with one of our advisers about your situation. This is a complicated area and the above information is of a general nature only. For details on your personal situation you should seek professional advice. Please contact one of our advisers at Get Advice.